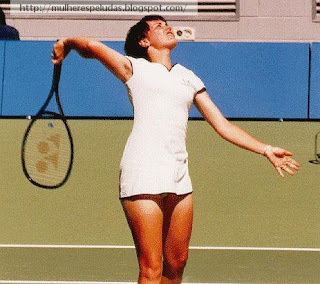 Martina Hingis nascida em 30 de Setembro de 1980, é uma tenista vinda da Suíça. Número 1 do mundo, venceu 5 torneios de Grand Slam, sendo 3 Abertos da Austrália, um Wimbledon e um US Open, além de 7 vezes ser vice-campeã em Grand Slams. 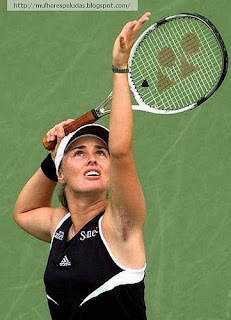 Em Novembro de 2007, Martina Hingis anunciou o fim da sua carreira no circuito WTA. Mas apereceu com as axilas peludas nos bons tempos em que era a número 1 do mundo em 1997. Martina Hingis born on September 30, 1980, is a Swiss tennis player. Number 1 in the world, won the Grand Slam tournaments 5 times. 3 Australian Open, one Wimbledon and one U.S. Open, in addition to 7 times be runner up in Grand Slam. In November 2007, Martina Hingis announced the end of his career in the WTA circuit. But show your hairy armpits in good times as it was the number 1 in the world in 1997.